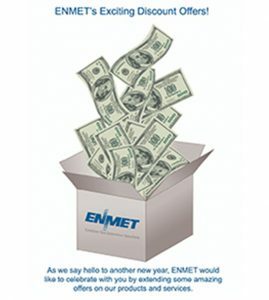 As we say hello to another new year, ENMET would like to celebrate with you by extending some amazing offers on our products and services. If you happen to have a Thermo Scientific MIRAN SapphIRe Analyzer, we will offer you a $1,500.00 trade-in discount off the price of a new MATRIX or MATRIX Plus. As you know this product has been discontinued by Thermo Fisher Scientific, so now is a perfect time to consider a switch to the MATRIX. If you don’t have a MIRAN SapphIRe to trade in, no worries we will offer you a $500.00 discount. Preventive maintenance is key to avoiding unexpected downtime. There is no time like now to make sure your ENMET instrument is operating at 100%. During the months of February and March, ENMET will offer a 10% savings on all service orders. All you have to do is call the service department (800-521-2978), request a Service Request Form, mention this newsletter discount offer and you collect the savings! Discount offers are available February 1st, 2019 through March 31st, 2019. Contact ENMET and mention this e-newsletter for more details. Unusual or complex gas monitoring applications? Put our experience to work. Contact our sales team directly at 800-521-2978 or by e-mail, sales@enmet.com. 0 comments on ENMET JANUARY 2019 NEWSLETTER – ENMET’S EXCITING DISCOUNT OFFERS!